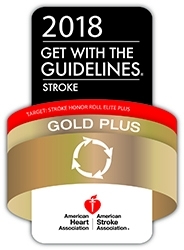 Aurora, CO, August 22, 2018 — Healthcare/HealthONE’s The Medical Center of Aurora (TMCA) has once again received the American Heart Association/American Stroke Association’s Get With The Guidelines®-Stroke Gold Plus Quality Achievement Award. The award recognizes the hospital’s commitment to ensuring stroke patients receive the most appropriate treatment according to nationally recognized, research-based guidelines based on the latest scientific evidence. The Medical Center of Aurora earned the award by meeting specific quality achievement measures for the diagnosis and treatment of stroke patients at a set level for a designated period. These measures include evaluation of the proper use of medications and other stroke treatments aligned with the most up-to-date, evidence-based guidelines with the goal of speeding recovery and reducing death and disability for stroke patients. Before discharge, patients should also receive education on managing their health, get a follow-up visit scheduled, as well as other care transition interventions. The Medical Center of Aurora additionally received the association’s Target: StrokeElite Plus award. To qualify for this recognition, TMCA met quality measures developed to reduce the time between the patient’s arrival at the hospital and treatment with the clot-buster tissue plasminogen activator, or tPA, the only drug approved by the U.S. Food and Drug Administration to treat ischemic stroke. The Medical Center of Aurora has been part of the Get With The Guidelines program since 2005 and has received a Stroke Award or Mission Lifeline Award, at various levels, every year. To learn more about TMCA’s award-winning care, please visit AuroraMed.com. The Medical Center of Aurora, the first community hospital in the Denver Metro area to receive two-time Magnet designation for nursing excellence by the American Nurses Credentialing Center (ANCC), is a 346-bed acute care hospital located in Aurora, Colorado. The Medical Center of Aurora is comprised of six campuses in Aurora and Centennial, Colo., including the South Campus, located at Interstate 225 and Mississippi, the North Campus Behavioral Health and Wellness Center, Centennial Medical Plaza, Saddle Rock ER, Spalding Rehabilitation Hospital, Spalding Rehabilitation at P/SL, and a medical office building at Green Valley Ranch. The South Campus facility is a Level II Trauma Center with Primary Stroke Certification and Chest Pain Center accreditation, and has an affiliation with Rocky Mountain Hospital for Children. The Medical Center of Aurora received ‘A’ grades from The Leapfrog Group (Fall 2015, Fall 2016, Spring 2017, Fall 2017), was Colorado’s only hospital to receive the Leapfrog Top General Hospital designation two years in a row (2016, 2017), and was recognized as the #4 hospital in the Denver metro area and the #4 hospital in Colorado by U.S. News & World Report (2014-2015, 2017-2018). The Medical Center of Aurora and its affiliated campuses are part of the HealthONE System. Learn more at AuroraMed.com.